I have a new auction up for an original CUSTOM painting on eBay here - the winning bidder will get to tell me how to finish the piece just for them! Choose hairstyle/colour, eye colour, skintone, theme, wings, pets, backgrounds, tattoos, whatever I can fit in this 6x6" painting - I will finish it to your specifications and mail the finished original to you worldwide! For details & photos or to place a bid, click here . One of my favourite paintings- "Faces of Faery 143" is this week's sale print! Only $9.99 for prints, open edition canvases only $90 this week here! Disney has released my Alice in Wonderland painting - "Alice in the Garden" as a GORGEOUS totebag, exclusively from Disney! Many resellers have them on eBay here or you can buy them in person at Disney's WonderGround Gallery in Florida or in Calfornia. Alternately you can order with the Disney Parks Shopping App (just search Alice in the Garden) or directly through Disney Parks Merchandise worldwide via email at: merchandise.guest.services@disneyparks.com or by telephone at: 877-560-6477 Just let them know you are interested in Jasmine Becket-Griffith’s "Alice in the Garden" tote bag / purse from WonderGround Gallery. 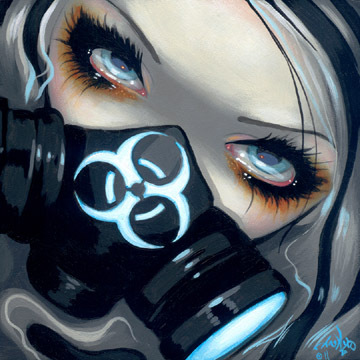 I have new ACEO cards - some feature artwork you may have never seen of mine before! Click here to see them all. 6x6" Original Acrylic painting customized just for you! On eBay now - bidding starts at one penny. Click here to see! These are always so much fun for both me & for the client! 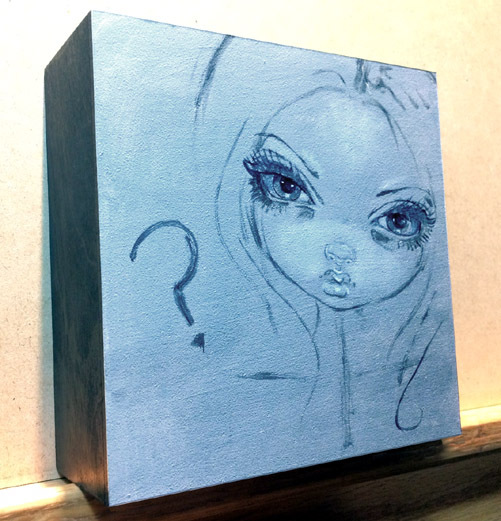 An original 6x6" painting from my Faces of Faery series - so far she just looks as she does in the photo above. Basically just a rough sketch of her face. She's on 2"deep cradled masonite board, so she will be ready to hang with no frame needed! Auction ends this Friday at 7pm EST. Bidding always starts at a penny to give everybody a chance. Email me at JasmineToad@aol.com if you have any questions. This is a rare opportunity, typically I have a 2-3 year waiting list on commissioned work, but I can squeeze in one of these little cuties every couple of months or so, so now is your chance! 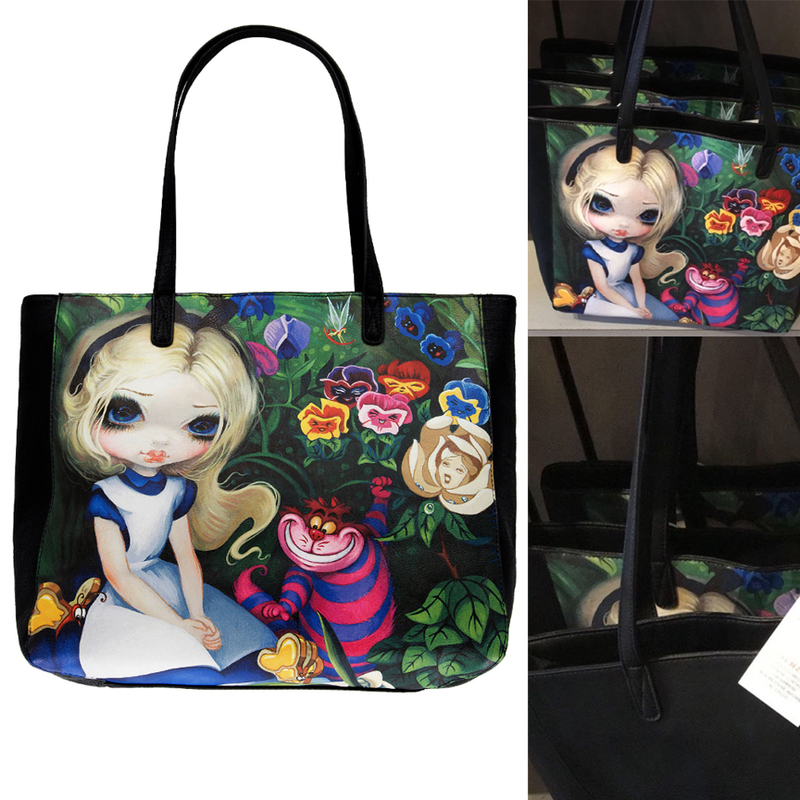 New Alice totebags from Disney! Disney has released my Alice in Wonderland painting - "Alice in the Garden" as a GORGEOUS totebag, exclusively from Disney! Many resellers have them on eBay here (many ship worldwide) or you can buy them in person at Disney's WonderGround Gallery in Florida or in Calfornia. Giveaway is tonight (Monday) at 8PM EST - click here to join us! 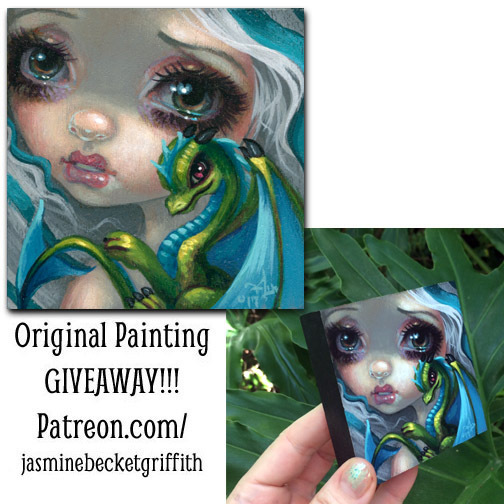 I'm giving away an ORIGINAL painting up at Patreon tonight - this little silver haired beauty with her baby dragon! My Patreon page is right here - those of you who are already patrons up there, you'll already be entered automatically. Not a patron yet? It's not free, but it is literally $1 so join, just click the Become a Patron orange button at the link here. I give away an original painting each month there, everybody there is included, I ship worldwide. 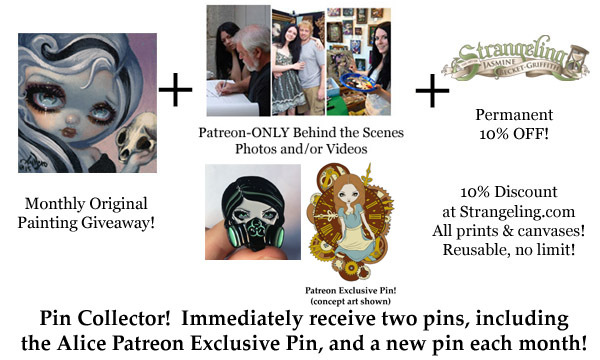 We also have other membership tiers (including the new exclusive PIN COLLECTOR tier for when I introduce my monthly enamel pin collection month - if you love pins, get in on the ground floor and don't miss any, some are Patreon exclusive! ), discounts, behind the scene stuff, videos & sneak previews you don't see anywhere else. Everybody at Patreon as of 8pm EST tonight will be entered in the giveaway, it just takes a minute to sign up. Details are here. There are tons of great artists, celebrities, actors, singers, performers, etc. up at Patreon and it's a great way to show support and get cool stuff. Print of the Week: "Faces of Faery 143"
This week's SALE PRINT is "Faces of Faery 143" Only $9.99 on my website here - we ship worldwide! The original and limited editions sold out long ago, but the glossy photo paper prints signed by me on the back are only $9.99 this week, and the open edition canvas prints (with a signed certificate on the back!) are only $90 on sale. Love this one, she is also the inspiration for my first-ever enamel pin (collection launches in April at Strangeling.com - stay tuned!). Every week at Strangeling.com (we have a new SALE print, always $9.99 - popular paintings from years past, new personal favourites - it changes each week. Always signed on the back by me personally! Check back on the Strangeling.com front page each Monday to see what the new sale print is! We always ship worldwide. I have a bunch of new ACEO cards up for auction, each also starting at just one penny. 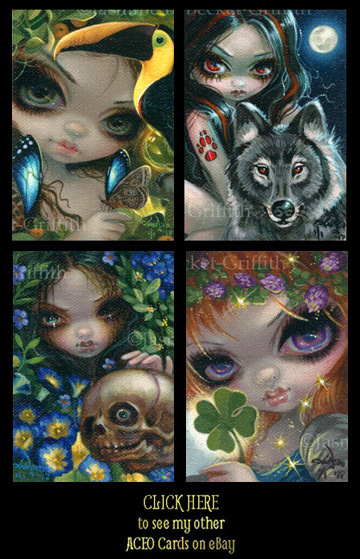 Tiny 2.5x3.5" art trading cards in the form of hand embellished canvas giclees - each is signed, dated, hand accented & numbered (numbered only #1 of 1, since only make ONE) in acrylic paint - you can see this new collection of cards - some you may have never seen - here on eBay. My first ever VINYLMATION doll from Disney! 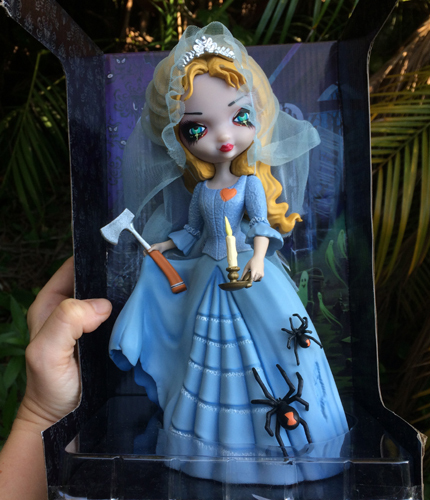 Special edition vinyl, 9" high, removable veil (her candle is removable too, poseable arm, etc.) - super cute. Gorgeously done. Again, these are at the Disney parks & galleries and are also online with worldwide shipping available at the retailer YourWDWStore here. You can find autographed copies on eBay all over the place too here. She was previously at DisneyStore.com too but sold out almost immediately (hopefully she'll pop up there soon as well for you DisneyStore folks!). 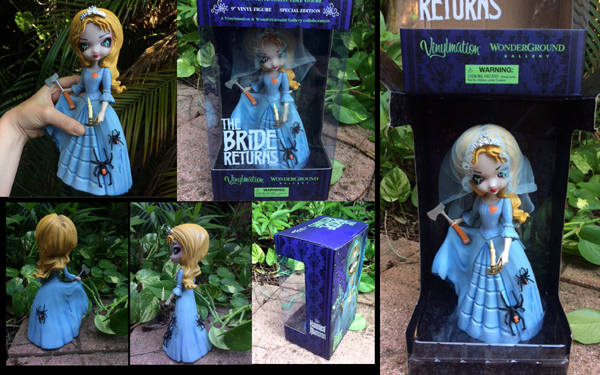 She's based on the Bride from Disney's Haunted Mansion, of course! My new painting "The Bride Returns" is featured on the backside of her box. Prints of the painting are in the Disney themeparks & galleries now and should be online shortly!